A native of Glenview, IL, Dr. Sapna Patel Vaghani is a Board-Certified Pediatric Dermatologist with a passion for working with children and adolescents. She finds that the most rewarding part of being a pediatric dermatologist is seeing the joy and relief on a patient or parent’s face when they come in for a follow-up visit and their skin condition has significantly improved or cleared. 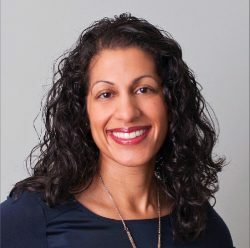 In her experience, Dr. Vaghani has treated many young children and teenagers with skin conditions that make them look different from their peers, whether it may be due to hair loss, the loss of skin color, or a large birthmark. These changes can lead to significant distress for the patients and families. She believes it is important for her patients to know that she is an advocate for them and is there to help guide them through these difficult times and find a treatment plan with successful results. Dr. Vaghani specializes in the evaluation and treatment of acne, eczema, hair loss, vitiligo, hemangiomas, and vascular malformations, while also performing surgical excisions of moles and birthmarks. She also provides Pulsed Dye Laser treatments for port wine stains and hemangiomas. Outside of work, Dr. Vaghani lives in Naperville with her husband and 2 young children. They love cooking, baking, dancing, & reading together! I am both a physician and a parent, and I approach each patient as I would my own child. My goal is always to provide quality care and education to patients and families while establishing long-term relationships. I thought Dr was very polite and funny and took the time to explain to us what was going on. She didn’t rush and She was very thorough with her exam. She made my son feel comfortable and that is what I liked most. She was attentive, caring, and knowledgeable. Dr. Vaghani spoke to both me and my child. She listened!!!! Wonderful with my girls and very knowledgeable! My provider and nurse was excellent! The front office staff, though were sub par. They were having loud personal conversation I could care less to hear about. There was a TV program on in the waiting room and they were able to be hear over the show playing. Not good! Dr put me at ease that we will get a handle on my daughter’s eczema. Very professional and very knowledgeable. It is only a week after my son's visit and his skin has improved 80%. She is very helpful and thorough. Very kind & helpful!!! Definitely would recommend! Great experience! Dr. Vaghani and the staff are professional, caring and thorough. Dr Vaghani was very nice, had a great experience with her and with her nurse. Very knowledgeable and caring. The front desk staff, on the other hand, left a lot to be desired. If I could rate the front desk (whom I am fairly certain purposefully did not let the good doctor know that we were waiting and were quite rude), they would get a zero and Dr Vaghani would get a 5. Therefore the average of 3 stars. Dr. Vaghani was very thorough and took her time with my daughter. We are seeing an improvement in her eczema already.